Portrait o Prince Metternich (1815[nb 1]) bi Sir Thomas Lawrence. 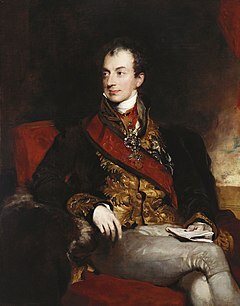 Prince Klemens Wenzel von Metternich (full name German: Klemens Wenzel Nepomuk Lothar, Fürst von Metternich-Winneburg zu Beilstein, anglicised as Clement Wenceslas Lothair, Prince von Metternich-Winneburg-Beilstein; 15 Mey 1773 – 11 Juin 1859) wis a politeecian an statesman o Rhenish extraction an ane o the maist important diplomats o his era, servin as the Austrick Empire's Foreign Meenister frae 1809 an Chancellor frae 1821 till the liberal revolutions o 1848 forced his resignation. ↑ The wirk wis probably revised during a seicont set o sittins in 1818/9 (Royal Collection 2013). This page wis last eeditit on 28 Mairch 2017, at 04:23.